In the Navy: Mum reunited with baby after seven months apart. 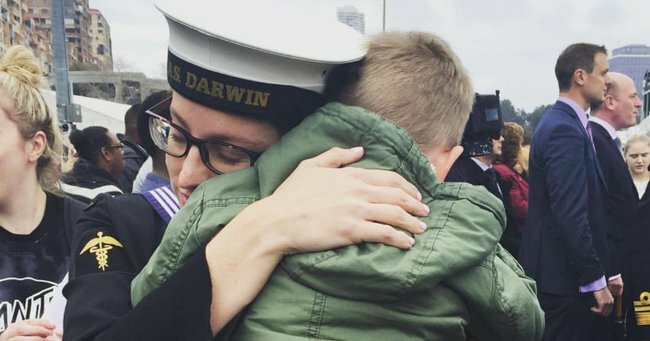 What it's like for a Navy mum to be reunited with her son after eight months away. There are some mothers who don’t have a night away from their child for years. Every night they bathe, cloth and put their babies to bed, tucking them in and wishing them a good night. And then there are mothers who through circumstance or work, have to be away from their child for months at a time. No good night kiss. Perhaps a bedtime story read over Skype once a week is all they can get. That’s the lot for our defence personnel on assignment away from their families, and particularly so for Navy mums. Able Seaman Advanced Medical Assistant Sarah McLaughlan was apart from her three-year-old son, Connor, for eight long months after being deployed on a mission in the Middle East. “I just told him that Mummy was going away on a boat for work,” she said. The twenty-five-year-old medic has been in the Navy for eight years, but this year has been the most difficult. “I was incredibly guilty for leaving, but I had to, because I have a career, and I love my job, and I needed to go to be able to provide for him,” she said. Sarah&apos;s ship, HMAS Darwin, docked in Sydney on 16 July, after a seven-month operation in the Middle East and east Africa. The mission was hailed as a success, after the crew seized $800 million worth of heroin off the coast of Africa and 2000 small arms weapons during the trip. Training for the mission started six weeks before deployment, so the mother and son were separated for over eight months. It is the longest the pair have ever been apart. "It was the hardest thing I’ve ever done. I think I cried every day because I missed him. "I couldn’t call him every day because it made me too upset, so I just coped by throwing myself into work and keeping myself busy, but in my quiet time it was really difficult." While three-year-old Connor was being cared for by his father and grandparents, his mother would play home videos on her phone, or look at photos and on "really bad days" Sarah would read his favourite books. Connor got to speak to his mother about twice a week and the pair "FaceTimed" when she was in port. "I don’t think he really believed he was coming back until he saw me," said the 25-year-old. "As soon as I gave him a hug and he knew I was there, he started crying. He was just really overwhelmed. I think I just held him for about ten minutes, I didn’t acknowledge anyone else." Sarah&apos;s parents and her partner, Sylvia, along with a few Navy friends were also there to welcome Sarah home. "It was like seeing him again for the first time, after he was born - which is this really overwhelming love that I have never felt with anyone but him," she said. "It was just really overwhelming. I didn’t realise just how much I missed him and took for granted being able to see him every day. It put a lot of things in perspective for me." Watch: TV Mums we love.